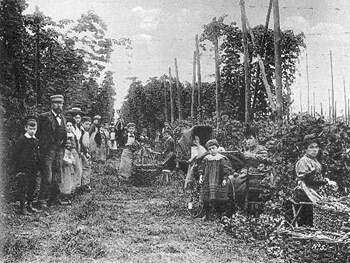 At the beginning of his memoir, William Wright shows how laboured work had been present in his life ever since he was a child: ‘Every year we had to pick hops and the harvest fields we cut the corn’ (7). By ‘we’ William is talking about his family, making this a family tradition. What could have been argued for Purpose and Audience can be more directly relevant to William’s memories of laboured work: ‘In the cultural practice of ‘autobiography’, published and unpublished, an author displays a self identity’ (Carolyn Steedman, 250). Part of William’s identity comes from laboured work. We see from his earlier quote that it has been part of his childhood, and it seems he never stops. Hope pickers. Picture found from The Museum of Kent Life. William’s adolescent years were far more labour-inducing, and not only due to his sweeping career: ‘before I was fourteen years old, I was master of the three trades’ (8). Here he is talking about being a cutler and an umbrella maker, further explaining, ‘This came in handy to me in after years’ (8). The reason for his carrying on in laboured work is for him to provide for his family, which will be talked about further in Part Two. 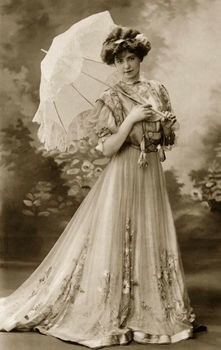 A Victorian Woman with an Umbrella. William could have made one similar. Image found from Greatest Stores. There is a possible reason why William makes his labouring work part of his identity, and it could come from his father. ‘He (William’s father) at once sent for a bricklayer’ (10) to rescue William. This shows how his father has a greater understanding of workers than many people would nowadays, instead of fetching for a policeman or a group of people, he chooses the worker most accustomed to the environment and situation. William has been brought up understanding how important labouring workers are. It is also important to note the role of police in 19th century England – to get a better understanding of William’s situation and how it could have influenced his thinking towards working class jobs. David Churchill says, ‘Many early accounts… tended to portray the provincial forces as ineffectual’ (458), and this was, admittedly, my first thought. However, he goes onto say that ‘subsequent police historians have offered a more nuanced picture, by demonstrating that local authorities were often instrumental in pioneering new forms of police organization’ (458) which not only shows the value of policing, but it also increased the worthiness of the bricklayer in this story. 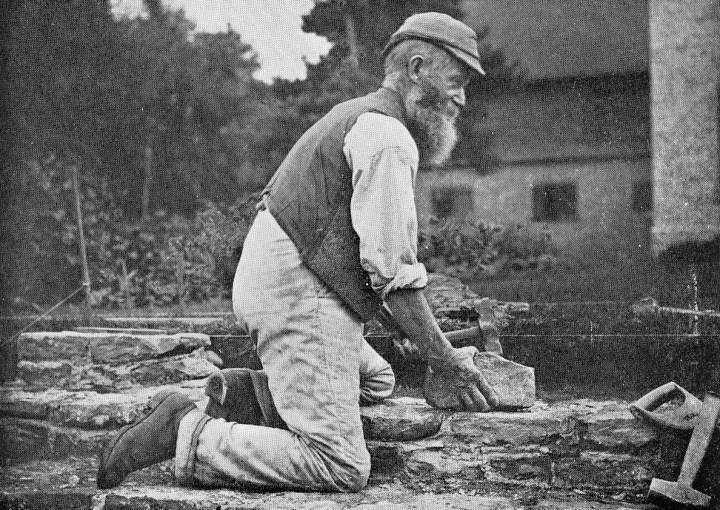 A Victorian Bricklayer. Image from The Victorian Web. Despite laboured work being part of his identity, there were some parts that William did not like: ‘The life of a poor little sweep boy was a hard life and a cruel one’ (13). We are given another perspective of his work. The pride and the focus he put into his work is put into question. Using ‘cruel’ as its description is strong and emotionally driven. I would argue that it comes from a place of hatred, since William rarely uses this type of language in his memoir. He is usually an optimistic man, usually talking about the negatives as part of God’s plan or a way to build his character. Other people’s attitudes strengthened the idea that being a chimney sweep was part of William’s identity: ‘He then asked me what I had been, and when I said chimney sweep and climbing boy he replied, “Come home with me. I am a master sweep’ (18). It becomes apparent that people saw William’s skills as a way to make money, even when he was younger, ‘“Guvnor, he’s a gold-mine!…”’ (19). What may seem like a carefree description of someone can actually show what made people, not only William, further their skills. If they make more money then they could break from their current class status, which is what William ends up doing later in life. When thinking about what his future career was shaping up to be, William has full confidence and excitement in himself, ‘Going up King’s Hill I got out and walked and felt so proud that I had a pony and cart that I fairly danced for joy’ (24). We get to see some of William’s personality shine when saying he ‘fairly danced for joy’. It shows his humanity, that his work gave him purpose and was leading to new opportunities. The amount of times he has gotten stuck while doing a job is another way of showing us the type of person William is: ‘I tried for a long time, but realised that I was once more stuck in a chimney!’ (29). It is making us question whether getting stuck is part of his working identity, too. This is hinted at further when William says: ‘thank goodness that was the last time that I was ever stuck in a chimney. (29). However, William gives us a reason as to why this all matters: ‘I had been married for only two years – and I thought that I was finished!’ (29-30). He has to consider his family. In part two of Life and Labour, we will explore how William’s labouring work is not only about identity, but how it is to provide for others. Churchill, David. “Local Initiative, Central Oversight, Provincial Perspective: Governing Police Forces in Nineteenth‐Century Leeds.” Historical Research, vol. 88, no. 241, 2015, pp. 458–481. Steedman, Carolyn. An Everyday Life of the English Working Class: Work, Self and Sociability in the Early Nineteenth Century. Cambridge University Press, 2013.